Yesterday saw the unveiling of a magnificent bronze sculpture by Ai Weiwei in New York, his first major public installation in the US. 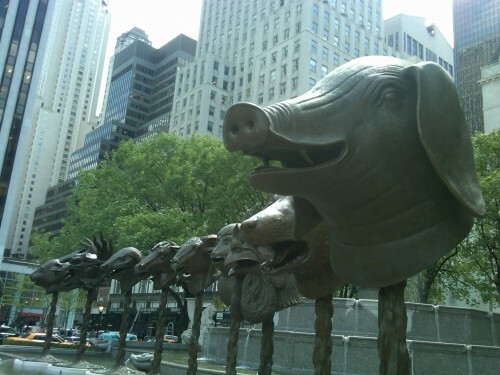 "Circle of Animals/Zodiac Heads" is at the Pulitzer Fountain in front of The Plaza Hotel, close to the Southeast entrance to Central Park. Weiwei is the renowned artist and social activist from China. His works include the Bird's Nest stadium for the 2008 Olympics in Beijing and a recent exhibition at the Tate Modern Museum in London. Weiwei was scheduled to attend the opening, but he has been held in custody and under investigation in China for alleged "economic crimes" since early April. He has ties to New York, having lived here from 1980 to 1993. At yesterday's opening, a curator from the Guggenheim Museum quoted Weiwei: "Without freedom of speech there is no modern world, just a barbaric one." For more background on the exhibition, you can read the New York Times' coverage here.